Learn to Live was produced and most of its tracks co-written by Frank Rogers, the man who has produced all of Brad Paisley’s albums. Paisley plays guitar on one track (today’s SOTD, in fact). So it’s nice to see that Darius is hanging out in the wing of the country music establishment that I favor. The album isn’t as strong as Paisley’s work but it has the same sort of good-natured charm. And of course Rucker has that voice, which is still in fine form a decade after it helped cut through all the disses of Hootie & the Blowfish as soulless, disposable pop. The album’s best moments are its lightest ones, like today’s song and the funny ‘Drinkin’ and Dialin’.’ Some of the sentimental tracks miss their mark, with one exception: ‘It Won’t Be Like This For Long’ is another in a long line of “watching your children grow older” songs and it never fails to move me. That formula is gold in country songs and Hallmark commercials and everything else besides. 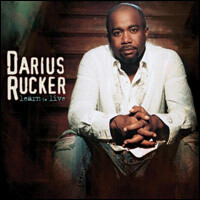 This entry was posted in 2008 music reviews, song of the day and tagged All I Want, Darius Rucker, Learn to Live. Rucker’s transition to country is certainly fascinating and I’m happy he found renewed relevance and popularity with the change. Today’s SOTD seems very well produced and played….always a plus in my book, but (shocker!) it’s still not my cup of tea. One of the biggest kicks for me in our journey down “music row” in Nashville was driving by Capitol Records, with a HUGE poster on the side of their building congratulating Darius for his hit record. This was the street on which we were most likely to spy some of these country music superstars, though on the sleepy weekend morning we spent the majority of time wandering the row it was quite empty. Still, I loved seeing Hootie’s face staring down at us – even though I’d never heard a single note from one of his country albums. I like this SOTD just fine, though I’m now off to search for the sentimental “It Won’t Be Like This for Long.” As much as I relish making fun of this so specific genre of country music (and, as you point out, Hallmark cards and, maybe, GE commercials? ), I’m a sucker for it nonetheless.